It's been almost five years since we reviewed D-Link's first consumer NAS, the DNS-323. And almost three since its last consumer NASes rolled out, i.e. the cost-reduced DNS-321 and four-bay DNS-343. Given the gestation period and the increasingly crowded consumer NAS market, you would think that D-Link had spent the time carefully studying the market and creating a monster NAS that would blow away the competition on price, performance, features or any combination of the three. 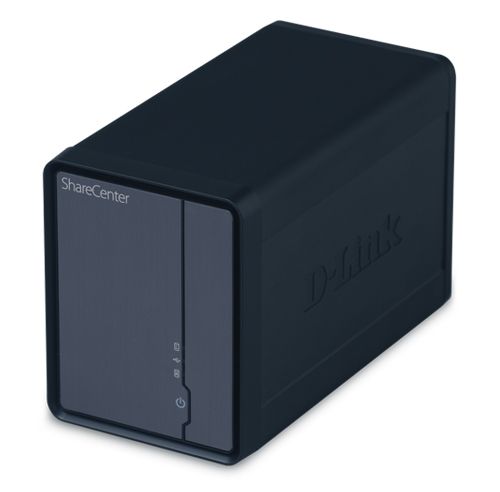 But while D-Link has definitely produced a better NAS than the 323 that the 325 replaces, it clearly trades off performance for lower manufacturing cost. The 325's physical design is very similar to the 321 and 323's. It has a solid black extruded aluminum case with a lift-off front cover that reveals two drive bays designed so that you can just slide standard 3.5" SATA drives right in without mounting them on trays. What you can't tell in Figure 1 is that the power button part of the front panel is flexy so that you can push it against the actual switch mounted on the front frame. Size is close enough to the same as the 323, about 4" X 5" X 8". Figure 2 is the rear view, which also will be very familiar to DNS-321 / 323 owners. The single Ethernet port is 10/100/1000, but doesn't support jumbo frames. That's no big loss, though. I stopped testing NASes using jumbo frames awhile ago because I found it didn't provide significant performance improvement with recent-generation computers. The single USB 2.0 port supports USB print serving and the usual push-the-button-to-copy-a-drive-to-the-NAS feature. Contrary to what the datasheet and manual say about USB UPS monitoring, I could find no evidence of it in the User Guide or admin GUI. You should also note that the USB port doesn't support backup to an attached drive. D-Link told me that UPS monitoring is shown in GUI under Management status once a UPS is plugged in. I did not verify this. If looking at the outside of the 325 evokes a sense of deja vu, the inside does too. Figure 3 shows the 325's chassis, which slides out from the back after removing two sets of four screws (and removing the drives). For comparison, Figure 4 shows the 323's chassis. Figure 5 is a close-up of the 325's main board. The Marvell SoC is still without a heatsink, but is a 1.2 GHz "Kirkwood" 88F6281 vs. the 500 MHz Marvell 88F5181 on the 323's board shown in Figure 6. The Marvell 88X7042 PCIe to Serial ATA Controller in the 323 is gone in the DNS-325, since that function has been rolled into the Kirkwood SoC. D-Link appears to have voted for profit margin over performance by choosing the 1.2 GHz 88F6281. It's the previous top-of-line Kirwood, which has since been eclipsed by the 1.6 GHz 88F6282. The 325's RAM is 256 MB up from 64 MB in the 323, while flash is now 128 MB vs. 8 MB in the 323. You'll see what all that extra flash is for shortly. The 325's Gigabit Ethernet port comes from a Marvell 88E1116R instead of the 323's Marvell 88E1111. Of course, the 325 runs Linux and it appears that it can run fun_plug if you're interested in hacking. You'll also see references to the less-expensive DNS-320, which has a 800 MHz Kirkwood, 128 MB of RAM and, I suspect, less flash. The 320 also doesn't support add-ins, which I'll describe shortly. The ESes aren't the quietest drives around and were responsible for most of the noise from the 325. But when the fan cycled on, even at low speed, I could definitely hear it in my quiet home office. Power draw was around 22W with both drives spun up and 7 W with them spun down. Speaking of power control, you can set idle drive spindown from a minimum of 5 minutes to a maximum of 5 hours. There is also a scheduled power off feature with one time per day, but you have to power on manually. Rounding out the power control features is a "Power Recovery" enable / disable. When enabled, the 325 will automatically restart when power is restored after a power failure. Note that there is no Wake-On-LAN feature.